The challenge this week is to use “Brown and/or Tan”. This little bag is made out of cardstock and embellished with a journaling card, flowers, lace and stick pins. (All odds and ends from my stash.) It will make a wonderful keepsake. I can see little bags like this being used for gift cards or party favors filled with goodies … or a hostess gift. What a cute way to say Thank You! The challenge this week is “SPRING”. It’s suppose to be spring here in Ohio … but I think mother nature is playing tricks on us!? We’ve had two nice days this month were it was actually a little warm and sunny and then Saturday it snowed … yes you read that right snowed! I’m beyond ready for nice warm weather! This little “Bee Happy” card makes me think “SPRING”. Kaboodle Doodles Challenge Blog. To be eligible for the prize draw you need to be linked by Sunday, April 28th. It’s Monday and time for another challenge from Kaboodle Doodles. The challenge this week is “black & white”. I love Pintrest and have to limit the time that I spend there (or I’d be in trouble). I’m amazed how easily15 minutes can turn into 45 minutes. I set a timer so when my time is over it’s over lol! While I was searching “paper medallions” I saw so many cool ideas. Seeing all that inspiration I thought I could crate something very clever … and so I did. We have redone our bedroom and I wanted something on the wall that would standout and be a focal point. This project was a lot of work! All that cutting, punching, scoring and gluing … but so worth it when it was complete. This project was so hard to get good photos of, but here's the finished project. The medallions are black, white and silver or gray and mounted on a piece of plywood which was then hung on the wall. Here are some close up shots. 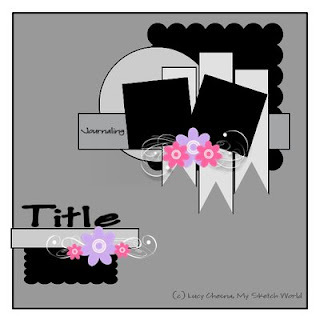 Link your project to the inlinkz tool on the Kaboodle Doodles Challenge Blog. To be eligible for the prize draw you need to be linked by Sunday, April 21st. The challenge this week is to use any shade of pink. I am having so much fun with the Cricut “Sweet Tooth Boxes” cartridge! The possibilities are endless. This cute little cupcake box needs to find a home and I have just the place for it. I think I will surprise a co-worker with it this week as a Random Act of Kindness. Link your project to the inlinkz tool on the Kaboodle Doodles Challenge Blog. To be eligible for the prize draw you need to be linked by Sunday, April 14th. The April first sketch is up at My Sketch World be sure to check it out. Be sure to visit the MSW Blog to see what the other Design Team Members have done with the sketch. I have a challenge posted this month be sure to check it out here. I have seen so many fun and creative techniques that I want to try on my layouts. My challenge this month is to try something new on a layout. You can find some inspiring ideas from other blogs, scrap booking sites, Pintrest and of course the My Sketch World forums. For my "Try Something New Layout Challenge" I made my own chevron background. It’s Monday and that means another challenge from Kaboodle Doodles. The challenge this week is to use 2 different patterned papers. I created this card using supplies from my enormous stash of left over paper and embellishments from other paper crafting projects. So besides the challenge at Kaboodle Doodles I challenge you to use up some of your paper and embellishments to create a card. Leave a comment on my blog with a link to your card and I will pick one random winner to receive a RAK from me. Can’t wait to see what you come up with! Link your project to the inlinkz tool on the Kaboodle Doodles Challenge Blog. To be eligible for the prize draw you need to be linked by Sunday, April 7th.